A.A. Milne, the creator of Winnie-the-Pooh was born on Jan. 18, 1882. To commemorate this milestone, Jan. 18 is Winnie-the-Pooh day. A.A. Milne, the creator of Winnie-the-Pooh was born on Jan. 18, 1882. To mark this milestone, Jan. 18 is Winnie-the-Pooh day. 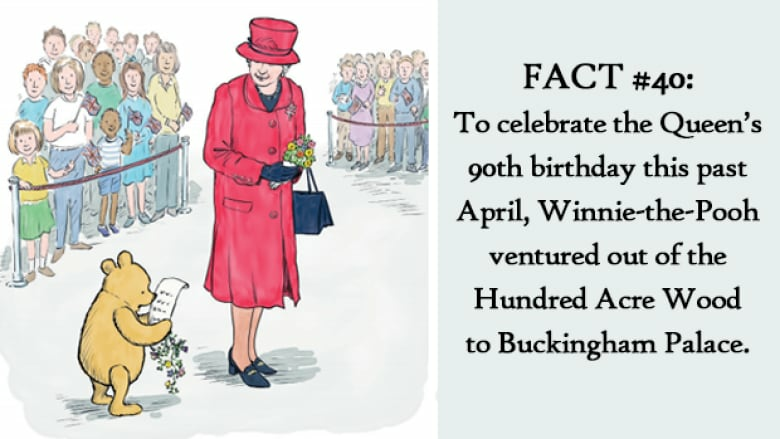 To celebrate, here are 90 weird and wonderful facts about the Hundred Acre Wood. 1. Winnie-the-Pooh was published on Oct. 14, 1926 and was an immediate success, selling 35,000 copies in the U.K. and over 150,000 copies in the U.S.
4. Colebourn, originally from Winnipeg, found the bear cub on a train platform in White River, Ont.¹ War trains would routinely stop in White River for four to six hours for maintenance and supplies, and to let the horses off for food and water. 11. Christopher received a teddy bear on his first birthday from his father, Alan Alexander Milne. It was an 18-inch bear from Harrod's department store in London, and it could growl. 12. The bear was originally called Edward, but Milne and his son eventually renamed the stuffed teddy Winnie after the adorable black bear at the London Zoo. 13. The "Pooh" part of Winnie-the-Pooh comes from a swan that Milne and his son encountered on vacation. They called the swan Pooh, which Milne described in When We Were Very Young. 14. The real Winnie had a sweet tooth — preferring condensed milk to raw meat. 16. Before writing Winnie-the-Pooh, A.A. Milne was a moderately successful humourist, playwright and mystery author. 17. Winnie-the-Pooh's first appearance was as an unnamed character in A.A. Milne's 1924 collection When We Were Very Young: "A bear, however hard he tries/Grows tubby without exercise." 18. As well as Pooh, Christopher Robin had a stuffed donkey, which would inspire Eeyore; a stuffed pig, which would inspire Piglet; a stuffed Kangaroo, which would inspire Roo; and a stuffed tiger, which would inspire Tigger. 19. 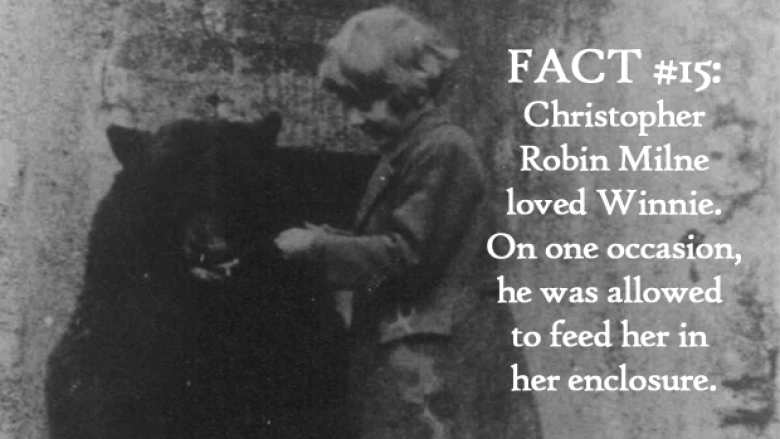 Christopher Robin invented voices and personalities for his stuffed animals, which inspired his father. 21. The toys recently underwent a major repair job, getting patched up, cleaned and vacuumed. Eeyore needed the most work. 22. The real Winnie died in 1934, living to be 20 years of age — that's two years older than the average American black bear would live to be in the wild. 23. The Royal College of Surgeons' Hunterian Museum in London, England put her skull on display. 24. Museum director Sam Alberti said Winnie's skull shows she lived with severe gum disease, likely because of the honey on sticky buns she was fed by adoring visitors. 26. Winnie-the-Pooh has been translated in over 50 languages, including Catalan, Thai, Esperanto and Latin. 27. In 2014, a meeting was held in the tiny town of Tuszyn, Poland, to decide upon a new patron for a local children's playground. Pooh was suggested, but then denounced due to his questionable attire (no pants). "It is half naked, which is wholly inappropriate for children," said Councillor Ryszard Cichy. 28. In a new collection of stories to celebrate the 90th anniversary of Winnie-the-Pooh in 2016, Pooh makes a new friend: Penguin. 29. The story's writer, Brian Sibley, said: "The thought of Pooh encountering a penguin seemed no more outlandish than his meeting a kangaroo and a tiger in a Sussex wood, so I started thinking about what might have happened if, on a rather snowy day, Penguin had found his way to Pooh Corner." 31. Milne said he liked to introduce new characters in order to keep stories fresh for people reading them aloud. 32. 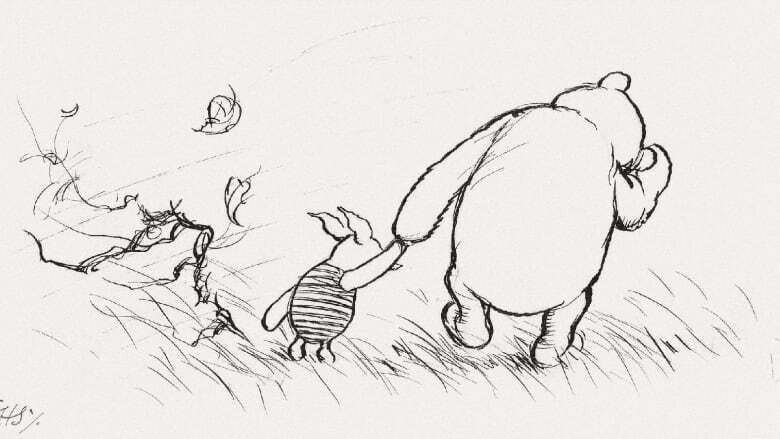 The Hundred Acre Wood characters Owl and Rabbit were the only two that weren't inspired by Christopher Robin's toys. Instead their characters came from real animals on Cotchford Farm, the Milnes' property in Sussex. 33. The Cotchford Farm estate was later bought by Rolling Stones guitarist Brian Jones. He died in the swimming pool there in 1969. 34. Milne's first attempt at children's literature was a poem called Vespers. He did not intend to write any more in this genre after that but, bored on a rainy holiday, he ended up writing the collection When We Were Very Young. 35. Goodbye, Christopher Robin, a film depicting the life of A. A. Milne, came out in 2017. It starred Domhnall Gleeson as A.A. Milne and Margot Robbie as Milne's wife, Daphne de Sélincourt. 36. Over 50 million copies of the Winnie-the-Pooh books have been sold worldwide. 37. Winnie-the-Pooh was voiced in Disney featurettes until 1977 by the actor Sterling Holloway. Holloway also voiced the Cheshire Cat in Alice in Wonderland and Sleepy in Snow White and the Seven Dwarfs. 38. A.A. Milne served in both the First and Second World War, despite being a pacifist. 39. The name "Winnie-the-Pooh" first appeared in print in a Christmas story by Milne, published in the London Evening News on Christmas Eve, 1925. 41. Pooh Bear met the Queen (and her great-grandson Prince George) outside Buckingham Palace, and presented her with a special hum song for her birthday. 42. Milne wrote a successful stage adaptation of Kenneth Grahame's The Wind in the Willows, called Toad of Toad Hall, in 1929. Prior to this, reviews of Grahame's book had been mixed; Milne's adaptation is credited with making the book a classic. 43. In the 1930s and 1940s, Milne went back to writing for adults, as he had before Winnie-the-Pooh. This included an anti-war book, Peace with Honour. 44. The sign above Pooh's door says "Sanders," which led to rumours that Winnie's last name was Sanders. It's not. Milne explained in a tongue-in-cheek way that Sanders is just the name on the sign that Pooh lived under. Which makes us wonder, who was this previous tenant named Sanders? 45. The Hundred Acre Wood was inspired by Ashdown Forest in Sussex, England. 46. Ashdown Forest was a deer-hunting forest in Norman times. There are no records of any bears living there, but there are foxes, stoats, weasels and badgers. 47. Speaking of British animals, Gopher was never in the original Winnie-the-Pooh books. He was added when Disney took over the brand, as a more relatable American creature. 48. The Milne family — along with illustrator Ernest H. Shepard — often visited the forest in the summer. 49. Editors at Punch magazine introduced Milne to his longtime collaborator, Ernest H. Shepard. Milne didn't really want his poems illustrated until he saw Shepard's work. 51. The American satirist Dorothy Parker was not a fan of Pooh Bear. She wrote this about the use of the word "hummy" to describe one of Pooh's songs: "It is that word 'hummy,' my darlings, that marks the first place in The House at Pooh Corner at which Tonstant Weader Fwowed up." 52. The A.A. Milne Pooh canon consists of When We Were Very Young, Winnie-the-Pooh, Now We Are Six and The House at Pooh Corner. There have been many new stories written by other authors since then. 53. Christopher Robin's stuffed animals took a U.S. tour in the 1940s. 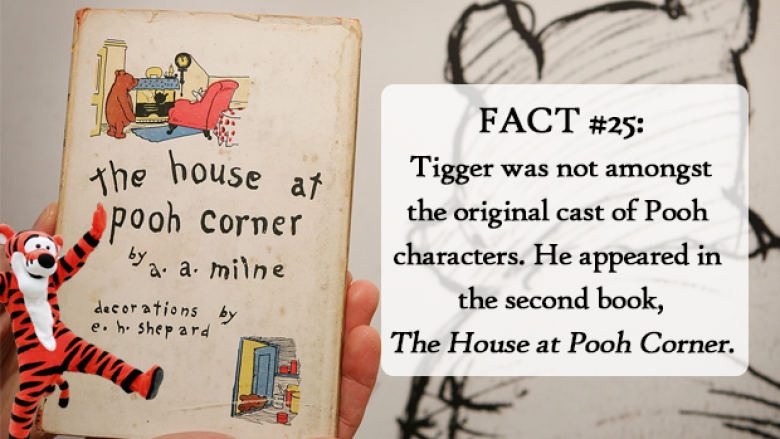 The collection was insured for $50,000 and included Pooh's birth certificate, signed by Milne to ensure its authenticity. 54. Winnie-the-Pooh inspired the bestseller The Tao of Pooh, which praises the honey-loving bear for being an "uncarved block," well in tune with his inner self. 56. You can send birthday cards to Winnie-the-Pooh courtesy of the New York Public Library, where Christopher Robin's original stuffed bear lives. 57. 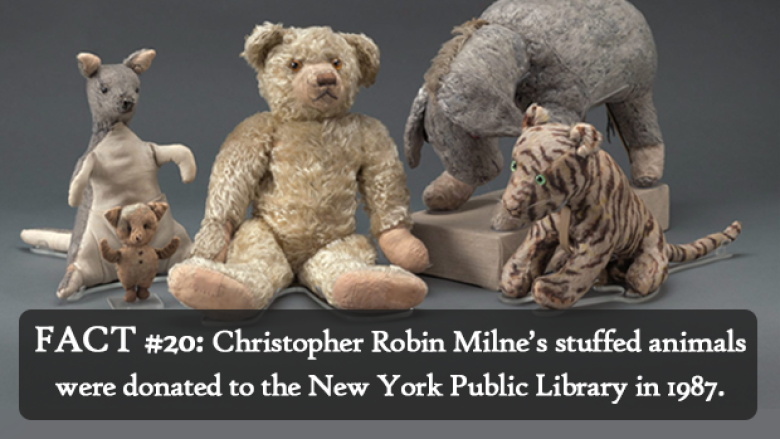 Kept in their bulletproof display case at the New York Public Library, Christopher Robin's original plush Pooh toys see about 750,000 visitors per year. They are extremely fragile and their environment is consistently monitored for temperature, relative humidity and light levels. 58. The only original toy you can't see at the New York Public Library is Roo. 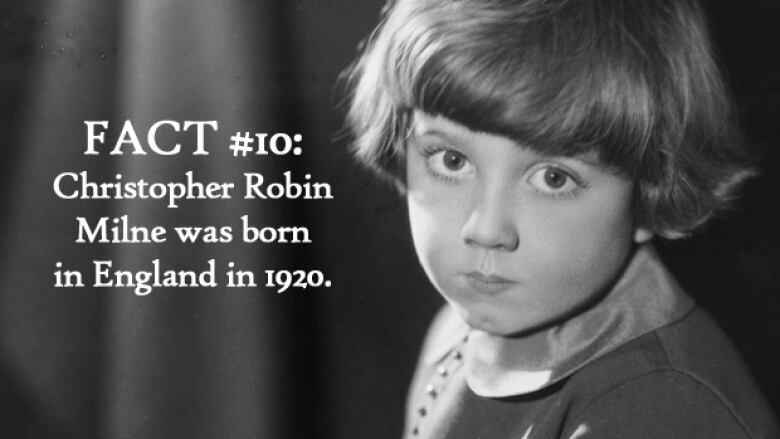 Christopher Robin Milne lost it sometime in the 1930s in an apple orchard. 59. Ernest H. Shepard's his favourite book to have illustrated wasn't Pooh, but Kenneth Greene's The Wind in the Willows. 60. There is a Russian cartoon version of Winnie-the-Pooh, called Vinni Pukh, and he is adorable. 61. Christopher Robin wasn't the biggest fan of his father's stories. Children at school used to tease him about Winnie-the-Pooh, and as Christopher got older, he felt that his father had earned his fame by standing on his son's shoulders. 62. 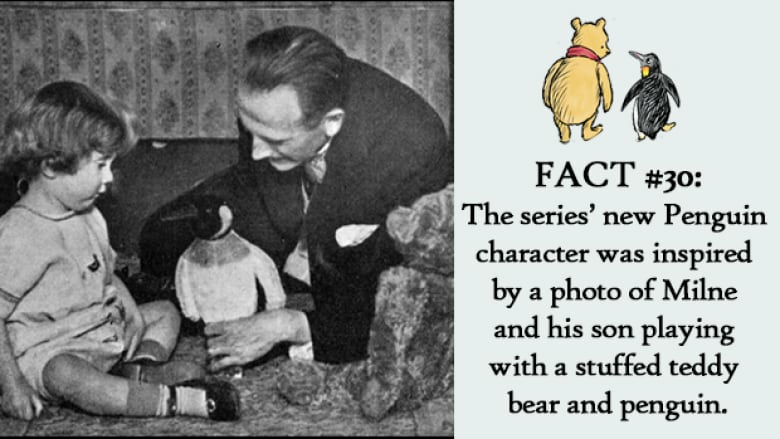 In fact, both A.A. Milne and the books' illustrator, Ernest H. Shepard, came to resent Winnie-the-Pooh as well, feeling the bear overshadowed their other work. 63. A group of researchers in the pediatrics department at Dalhousie University published a report entitled Pathology in the Hundred Acre Wood in the Canadian Medical Association Journal's winter 2000 lampoon issue. The satirical article assigns each Milne character at least one psychological disorder. 64. The article posits that Pooh has ADHD, OCD and microcephaly (due to his Very Little Brain); Piglet has generalized anxiety disorder; Eeyore suffers, evidently, from depression; and Tigger has a "recurrent pattern of risk-taking behaviours." 66. There is a street in Warsaw, Ulica Kubusia Puchatka, named after Winnie-the-Pooh. 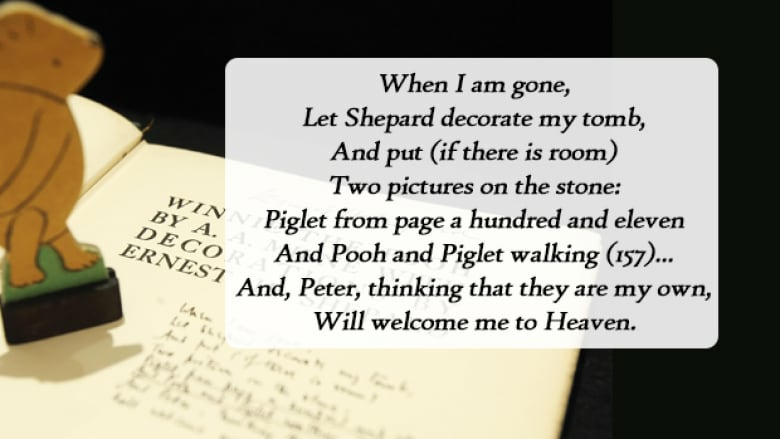 It has a stone tablet of Winnie walking hand-in-hand with Piglet. 67. There's also a street named after him in Budapest (Micimackó Utca). 68. A repatriation battle broke out over Christopher Robin's original Pooh toys in 1998, when British Labour MP Gwyneth Dunwoody started a campaign to bring them back from the New York Public Library, saying, "Just like the Greeks want their Elgin Marbles back, so we want our Winnie-the-Pooh back, along with all his splendid friends." New York's mayor at the time, Rudy Giuliani, vowed to "do anything" to keep them. They're still in New York. 69. 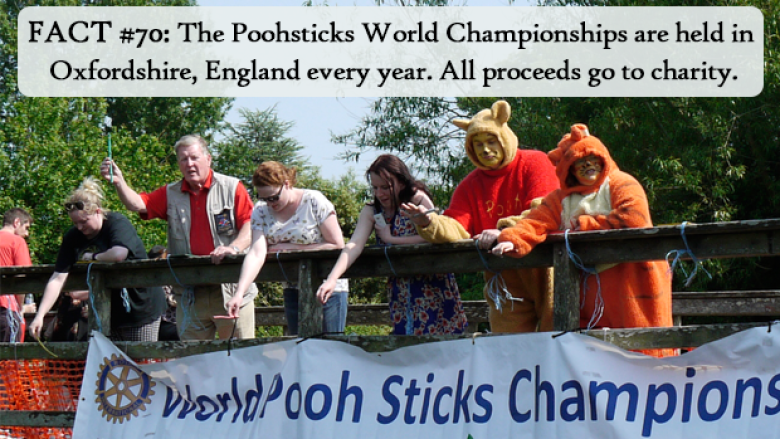 Remember how Pooh and the gang have a game they play called "Poohsticks"? Well, here's how you play it. 71. White River, Ont. 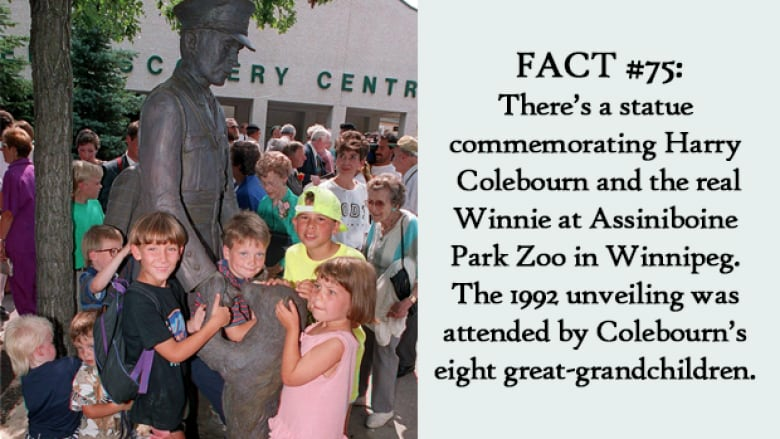 — where the original Winnie was first found as a cub by Harry Colebourn — holds an annual Winnie-the-Pooh festival in August. The 2016 edition included a historical re-enactment of the original purchase of Winnie, as well as a parade, a fish derby, a spaghetti supper and bingo. 72. Ryerson University in Toronto worked with Colebourn's great-granddaughter, Lindsay Mattick, to curate a special exhibition devoted to the real story of Winnie. Here's a video about the project. 73. Winnie-the-Pooh was briefly banned from some U.K. public schools in 2003, in fear that Muslim children would be offended by a talking pig. This edict was overturned by the Muslim Council of Britain, who voted to end the "well intentioned but misguided policy." 74. Forbes magazine has ranked Winnie-the-Pooh as the second most valuable children's character in the world, after Mickey Mouse. 76. Fred Colebourn, Harry's son, fought to have Winnie and his father's story properly recognized. Here he is being interviewed by CBC in 1987. 77. The Guinness World Record for the largest "Pooh and Friends memorabilia collection" is held by Deb Hoffmann, from Wisconsin. Hoffmann received her first Winnie-the-Pooh when she was two years old, and as of the record-setting date in 2015, she had amassed 13,213 Pooh items. 78. In Grade 6, Hoffmann wrote a story based on that same stuffed Winnie she was given at age two. Hoffmann had sneaked out of bed to go to the bathroom and saw her father come home with the toy. The title of Hoffmann's story was Pooh on the Toilet. 79. Disney animator and Orthodox Jew Saul Blinkoff has hidden various Jewish "Easter eggs" in his Winnie-the-Pooh films, including a mezuzah (a tiny Hebrew scroll in a case) on Winnie's door. 80. A 2004 TV movie called A Bear Named Winnie tells the story of Harry Colebourn (played by Michael Fassbender) and Winnie (played by three different bears: Chester, Charlie and Bonkers). It aired on CBC Television in December of that year. 81. Tigger's iconic line in the Disney adaptations, "T.T.F.N, Ta-ta for now," was ad-libbed by Tigger's voice actor, Paul Winchell, and it stuck. 82. Eeyore's downcast manner apparently came from the fact that the real Christopher Robin's toy lost the stiffness in its neck stuffing as time went on, and his head started hanging down. 83. Kanga was a "he" in Milne's original notes, but was changed to become the only female character in the books. 84. 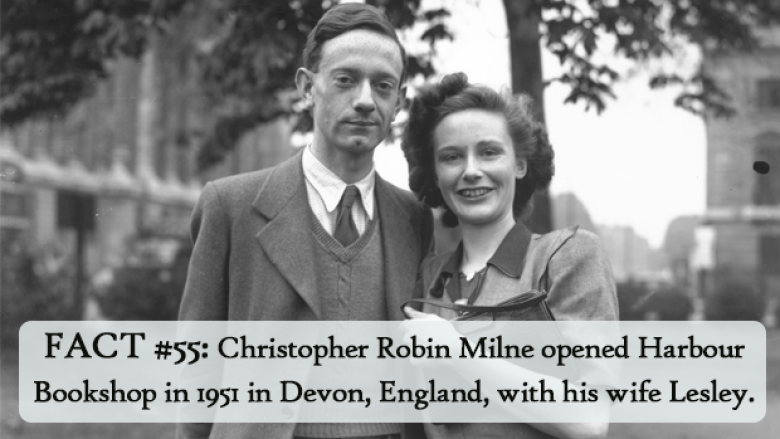 A.A. Milne's father ran a private boarding school, which A.A. attended. One of his teachers was a young H.G. Wells, who went on to become an iconic science fiction author. 86. Thanks to a questionable Disney show from the 1980s, Pooh and the gang warn of stranger danger. 87. The Latin translation of Winnie-the-Pooh, Winnie ille Pu, is the only book in Latin ever to make it onto the New York Times bestseller list. 88. Thanks to an epic merchandising empire, Winnie-the-Pooh is estimated to be worth £3.75 billion annually ($6.3 billion CAD). In comparison, the Queen is estimated to be worth about £350 million annually ($588 million CAD). 89. 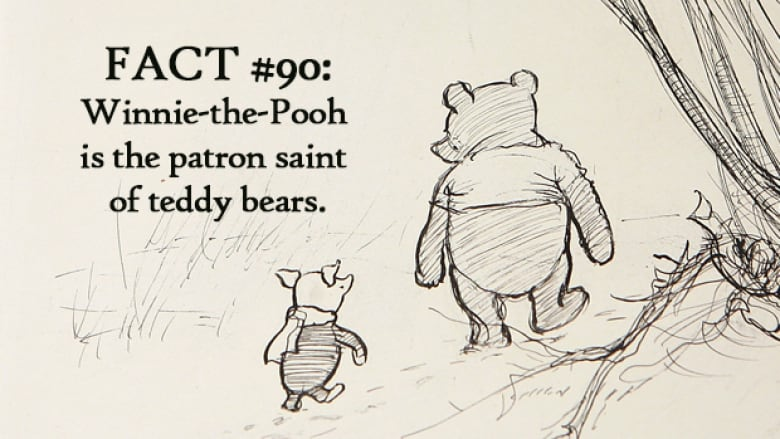 Cambridge University's Pembroke College Winnie-the-Pooh Society was established in 1993. The Queen is apparently a member. They regularly meet at 4 p.m. every Saturday of the full term to drink tea, eat cake and read from the works of A.A. Milne. The annual membership fee is £2 ($3.35 CAD). 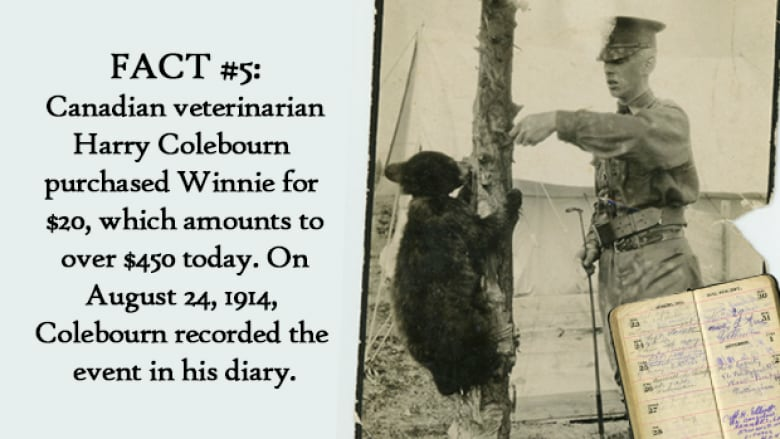 ¹From Finding Winnie: The True Story of the World's Most Famous Bear by Lindsay Mattick ©2015, published by HarperCollins, as well as files from Mattick's personal collection.